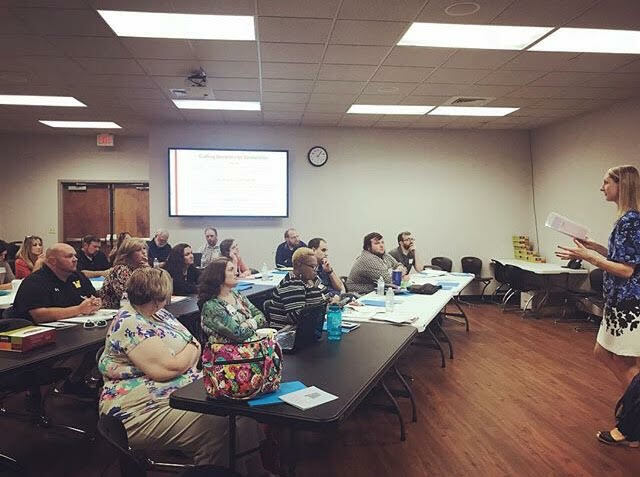 In 2018, the David Mathews Center for Civic Life had the honor of receiving a grant from the Alabama Bicentennial Commission to bring workshops on place-based, deliberative learning in the classroom to in-service regions around the state. From Washington County to Athens and many communities in between, the DMC had the privilege of sharing what we’ve learned about engaging students in social studies and civics through classroom discussions that emphasize perspective-taking, critical thinking, and the examination of historical events through the local lens. What options did citizens have to address injustice during the Civil Rights movement? What choices were available to tribe members during the Creek War? When we think of the economic future of our communities, what opportunities do we have? And when we consider all of the available options in front of us, have we weighed the costs, benefits, and tradeoffs of each as we make our decision individually and as a community? Whom will our choices benefit and whom may they harm? While bringing deliberation into classrooms is always a rewarding and enlightening experience, bringing the tools of deliberation to nearly 300 educators this past year has been equally rewarding. Through the generous support of the Bicentennial, we have been able to equip 47 schools with a trained moderator. In 2019 we look forward to hearing all about the ways that these teachers continue to innovate as they put the hard work of deliberation into practice in their classroom. If you would like to register for one of our upcoming 2019 deliberative workshops, or share how you are putting what you learned at one of our past workshops to use in your classroom, contact Gabrielle Lamplugh, glamplugh@mathewscenter.org.